Typecasting from Paradise City. The other one. You may want to click these to enlarge them. Just a suggestion, nothing meant by it. Oh, and there’s probably a few errors. Proof reading is for wimps. Or people with actual writing careers. *Correction ‘still waking up in the darkness, to asleep to have a conversation. But you probably got that anyway. 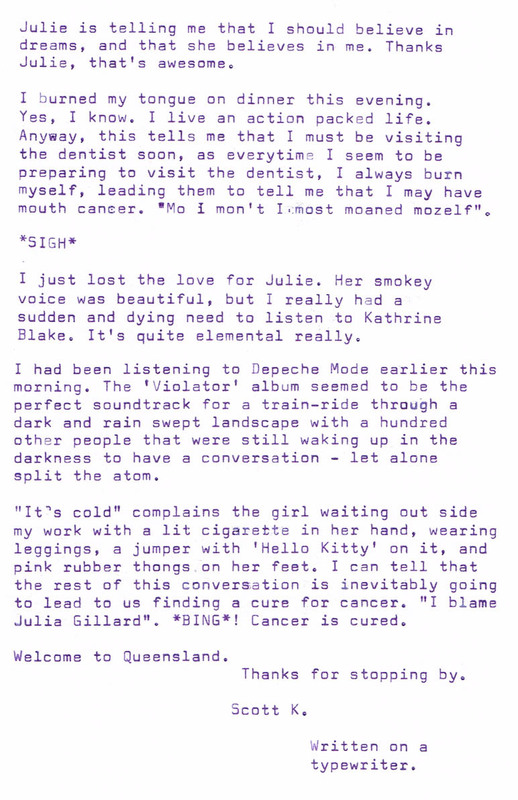 June 26, 2012 in cane toad, errors, Julie London, Katharine Blake, purple ink, queensland, rain, stupid idea, tourism., travel, typecast, typewriter, welcome. ← Comments on comments on comments. 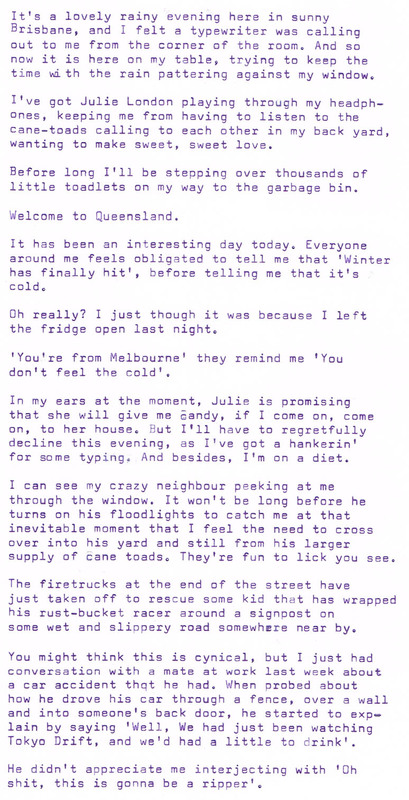 I've had days like that, except they happen in Melbourne…minus the Julie London (although my wife has one of her CDs) and the cane toads. Hang in there. And gettest thee to thou dentist post haste. No, you're all just too damn expensive. Nice blog. I don't “get” that last paragraph but you sure do write well. And right on cue: a little pang is felt at my wisdom tooth that my dentist keeps reminding me I need extracted. And days like these, well… Having an amazing typewriter to bash it down with helps! AH! Well, there's probably quite a few things in here that will have most Australians nodding, but wont make much sense elsewhere. Firstly, Queensland is made up of people that often only wear one pair of shoes – rubber thongs. Even in winter. This often provides me with endless comedy for me in winter as people try to insist that the sub tropics are tropical all year round. The latter comment about 'Julia Gillard' – which unfortunately actually happened – relates to our current political climate, which is currently quite hostile to our prime-minster (Julia Gillard) imposing a tax on carbon pollution. Everyone was happy here about dealing with environmental issues until they suddenly had to pay for it, now everything that goes wrong is oddly blamed on Julia Gillard, including cold days – because she is taxing (although not yet) people to act on global warming. It's much more complicated than that.. But I think that might cover it. But my 'cure for cancer' comment, was my way of implying that the conversation was unlikely to be an intellectual pursuit.